My Perfect Life Planner also allows you to organize your medication schedule, and alerts you when medication is required. The list shows everyone in your immediate family. Select a recipient. Choose the medication from the supplied list of almost 3,000 common drugs. 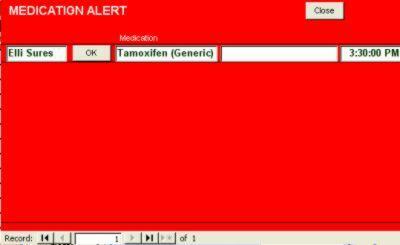 If the required medication is not listed, type the name. Fill in any other information you want. The 'Description' field helps when you have several pills that are different. For example, you could use descriptions like "small yellow and red pill". Enter the medication schedule and close the form. An alarm window will open 15 minutes before the medication is scheduled to be taken. If you close the window without clicking on the OK button, the alert will reappear in 1 minute. The Medical alert section is part of a greater program called My Perfect Planner. It should also be noted, that our program is intended for casual use. use your usual alert method until the program can satisfy your medical concerns. We definitely do not want any negative reactions to our work.